If my Soy Beans are Green, why is my Soy Milk White? Kitchen Table Questions About Soy. I'm not going to simply regurgitate the conflicting data spread across thousands of published articles on soy. I prefer to start with what I know for certain: my food. The kind I eat. Whole food. 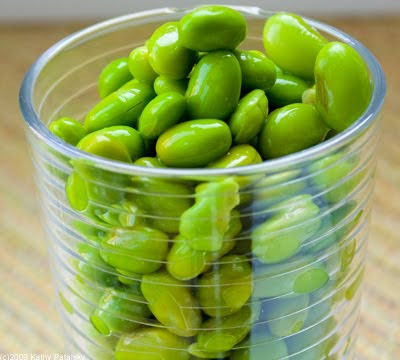 So as I sit here plucking tiny tender green soy beans, known as edamame, from their never-been-opened by man green bean shells, I start my investigation with a few kitchen-table thoughts. Is Soy Good for You? Yes! And no? Let's discuss. Soy contains a complete amino acid profile when it comes to vegetarian protein, and soy contains the nutrition-buzzword soy isoflavones, which may be beneficial in lowering your risk of everything from cancer to heart disease. But perhaps like me, you've heard a few rumors discussing the dark side of soy. A number of published studies have shown that too much soy may be a bad thing. So, who do we believe? Asian cultures have been eating high amounts of soy for centuries, and appear to be doing just fine. In fact, Japan continues to have a soaring life expectancy age of 82 years of age. Impressive. So as I said above, my investigation of soy will start at my kitchen table, rather than an article database. Young vs. Old Coconuts. Those brown, small, hard and fuzzy coconuts are simply, old-mature. Inside they have a thick white flesh shell and a small amount of coconut water/milk gushing around inside. Grind the flesh and water together, and you get 'coconut milk'. Coconut milk is high in fat and a thick white color. However, take that same coconut at an earlier stage in its life and you would find it to be large, green, with a smooth shell and filled with only a thin amount of a creamy white flesh and a lot of gushing liquid (or endosperm) known as coconut water. Grind up this coconut water and flesh and you will get a different version of 'coconut milk'. Same coconut, different age, different insides. I even discussed this back when I found a mysterious white coconut a while back. The same basic theory of young vs. old, applies to my green edamame. 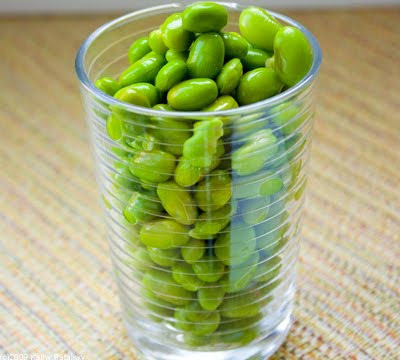 Young soy beans are green, sweeter and used to make edamame. While a mature or aged soy bean will be beige to brown and will most likely used to make soy products such as tofu and soy milk. They may also be dried and sold as soy nuts. "To make tofu, we use soy milk. Now, most commercial tofu makers make their own soy milk, which anyone can do by soaking, grinding, boiling, and straining dried (or, less commonly, fresh) soybeans. When you have your soy milk, you then need to add a coagulant. When you coagulate something, you cause it to curdle. In other words, you transform it from a liquid into a soft semisolid or solid mass. " Tofu is made from White Soy Milk. So now that we have the tofu mystery solved (tofu is white because it is made from white soy milk). Why is soy milk white if my edamame is green? Well as I hinted, soy milk is usually made from mature and/or dried soy beans which are beige or brown in color. The processing of these beans leads to a milky white soy milk color. Thus, soy milk is white because it is commercially not made from young beans. Which Bean is Better? So my next question is: what is the difference between young and old soy beans? I know that the nutrition properties of 'old' coconut milk vs. 'young' coconut water varies drastically. So why don't I ever hear the difference between mature soy milk beans and young soy bean edamame? Google Searching for Image Answers. A image never lies, so maybe I could find some answers from the image search web. My quest: find out if green tofu or green soy milk exists! Oddly enough, when I googled "green tofu" for images, the first few images that came up were of a Green Tofu Salad that I posted a while back. It used white tofu and some edamame-not what I'm seeking. 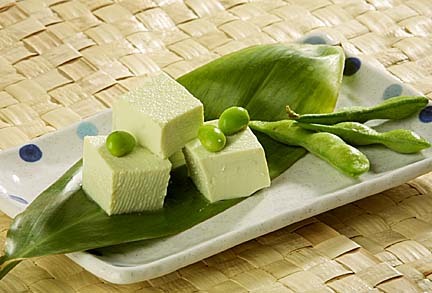 But a few pages down, I did find this interesting image of actual green tofu made from edamame beans. Green Tofu Link here. Green Soy Milk? Next, I googled "green soy milk" and found one photo of an adventurous blogger who indeed made her own homemade soy milk using green colored soy beans. Note that these were not 'edamame' but rather black hulled soy beans that are green in color when the black shell is removed. Just as I imagined, the soy milk made from green colored beans came out a pale green color, rather than a milky white. Brilliant! Looks delicious! Green Bean Soy Milk Link here. NOTE: Make your Own Soymilk? 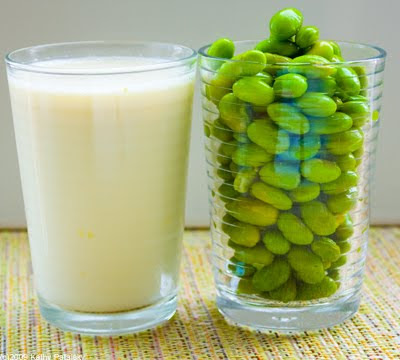 If you have ever attempted to made soy (or soya) milk from edamame beans please let me know! I've found a few text references to it online, but an actual blog post with recipe/images cannot be found. Anyone adventurous out there to try it with your soymilk machine??? What is Healthier? Green or White? So now that I've discovered that commercial tofu and soy milk is simply not made with green soy beans, thus is not green, my new question is: what is healthier? Edamame or mature soy beans? Nutritionally Speaking. If edamame is healthier, then perhaps my soy milk, burgers and tofu should be coming from those yummy green beans instead of white/beige! And maybe I should be tossing whole edamame beans into my salad rather than chunks of white tofu. Both servings contain 113 calories. *Soy milk is white because it is processed commercially from white or beige 'mature' soy beans. 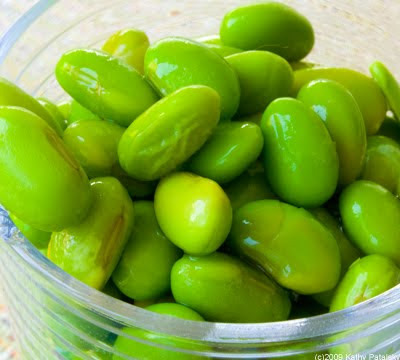 If it were to be made from young edamame beans, it would indeed take on a more greenish color. * Tofu is not green because it is made from soy milk. Green tofu is possible if you use a soy milk made form edamame. 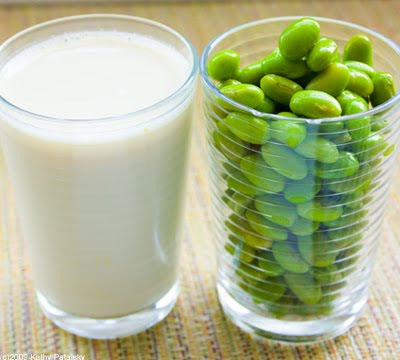 *While the nutrient profiles for young vs. old soy beans vary slightly, it is not so drastic to turn you off of commercially processed soy products vs. edamame soy products that you could make at home with a soy milk machine. *lastly, whole foods that are as close to their natural grown state as possible are always best. Processing will almost always affect the food in both appearance and nutritional value. So while processed soy products are good and well, whole soy beans (young and old) that have not been processed are the optimal way to consume soy. Everything in moderation. And eat a mix of edamame/tofu/soy milk.